This post is one that I wrote in March of 2013. The sentiment and intention for its writing is once again very true and this year, in particular has been brutal for many leaving them feeling less than empowered by the choices, responses and reactions that have occurred. The irony is that this post came on the heels of an intense winter and the promise of Spring close at hand. Now, we find ourselves entering into the unknown of what this upcoming year’s winter will bring and the greater opportunity to move inwards in reflection as we bolster and “batten down the hatches”….. It seems that many are having multiple challenges at all levels of their lives over the course of the past few months. These challenges may have been exacerbated by the intense winter weather, power outages and stressful commutes. This week’s post is an opportunity to release any challenges you are facing and craft within yourself the space of renewal and empowerment. As Spring approaches and the promise of warmer days is just ahead, time for a little spring tune-up. Good– Read through the pathworking each time you want to use the pathworking. Make note of pausing in the reading wherever it feels like more time would be spent in the specific train of thought. Best- Employ the physicality of recording the pathworking in your own voice, which produces an effective recognizable neurological imprint inducing physiological response and imprint to listen to. Be sure to speak slowly (more so, if you tend to speak quickly and do not annunciate well) and clearly and to give pause where it would naturally occur if you were reading aloud. There may be some points in the meditation where you will want to spend several minutes in the locale that is being presented. Remember to give adequate time of silence for this. Do not stop the recording. Pause in your reading of it and then begin again when sufficient time has passed. Allow the amount of time you wish to have to fill the space on the recording and then resume the reading of the pathworking. Find a comfortable place where you will not be disturbed. Sit back and Enjoy! Relax your mind and body as you sit in a comfortable position. Close your eyes and take 3 deep breaths; slowly inhaling 1-2-3 and exhaling 1-2-3. Allow your body to establish a gentle, even rhythm of breath; taking you to a restful and peaceful state of consciousness. As your breathing becomes restful allow your consciousness to shift upwards; passing up through the ceiling of the room you are sitting in room and up through the roof of the building. Continue this ascent upwards and out into the moonlit sky. You are aware of the rooftops below and the velvety sky above. As you travel upwards you become aware of a thick brown and green mist forming around you. You become aware of the smell of loamy, rich, brown earth and you feel the texture and support of soft fertile dirt beneath your feet. You realize that you are standing in the midst of a lush green forest with trees forming a canopy above and the support of rich brown earth underfoot. Take a moment to take in the smells, the energy and the feel of this perfect space of nature’s creation. As you look up towards the canopy of trees above you are aware of a glowing white orb slowing descending towards you. As this orb of pure white light descends to within arms’ length, you realize that this place and orb of healing light have been created to bind, contain, heal and transform that which troubles or burdens you. Now, in this place of perfect grounding and trust, give form to those things that you wish to release. Give form to those issues and situations which cause you concern. Give form to all that you feel is of challenge and obstacle at this time preventing you from being your highest self. With intent and will reach out, gather these forms together and push them into the center of the brilliance of the sphere in front of you binding them firmly into this single orb of release. Once the orb is filled with all that you wish to release, reach out and grasp it in your hands, holding it outstretched and away from you. Take a moment and take note of the feel and the weight of it. Feel the energy of all that you released to it pulsing within. As you think on this, you become aware of something shining in the moonlight, and as you take a few steps forward you realize that it is the reflection of the surface of a small pond a few feet ahead of you. The water sparkles like diamonds in the moonlight and it radiates peace and serenity. You feel that if only you could touch it, and slide into the shimmering liquid that it would wash away all of the remaining tension that you have. Slowly you remove your clothes and drape them over the nearby bush. You step to the edge of the water, sit down on the grass and dangle your feet in the pond, noting that the water is surprisingly warm. The pond is not deep, so you slide in and sit leaning against the bank; your head gently resting on the soft grass at water’s edge. As you close your eyes and relax into the warm water you feel all of the tension and concern slipping away; drawn deep into the cleansing waters. Take a moment and truly feel the peace and calm enveloping you. Rest in the gentle support of the healing waters and feel every cell of your being opening to renewal. Something gently brushes against your feet and you open your eyes to see that a lily pad is floating towards you with something shiny on it. 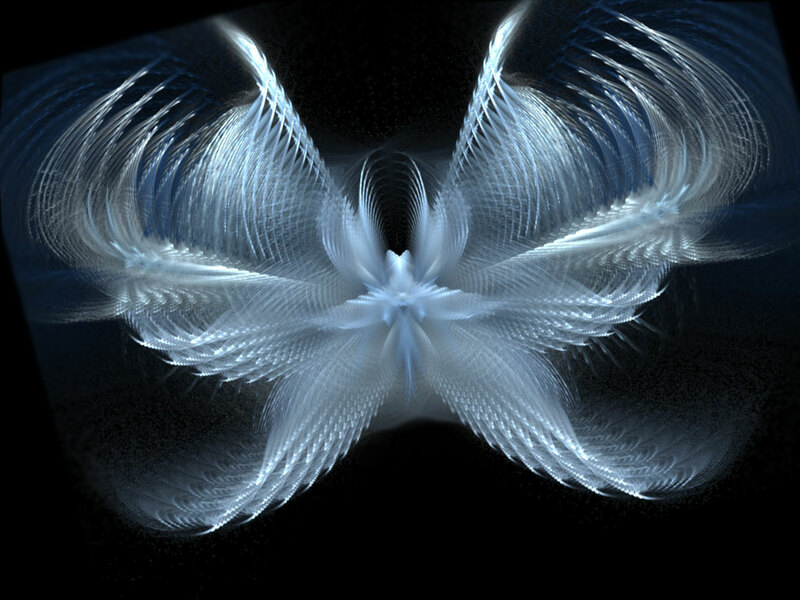 As the flower moves closer you notice a sparkling powder in the center. You take a little of the powder and wet it. It lathers and foams forming bubbles and you begin to wash your body with the foam. It tingles against your skin, energizing and revitalizing wherever it touches. Take a moment to relish the feel of this energizing foam and when you are ready slip down into the water and wash the foam from your body. As you wipe the water from your eyes you see that a goblet of fine crystal, filled with a golden liquid has been placed on the grassy edge of the pond. Curious, you take the goblet in your hand and hesitate a moment before lifting it to your lips. You only hesitate a moment because you know that you are in a place of perfect love and perfect trust and that all in this special place are gifts from the Goddess and Her world of Nature. You slowly tilt the goblet and allow the liquid to flow down your throat and you know intuitively that this is a liqueur of inner strength and self-confidence. This is the empowering nectar that all have savored who would live their truths and stay strong on their course of purpose. As the nectar fills your being, turn your thoughts to how you would wish to be a stronger person. What truths you would wish to manifest in your life. What the essence of the truth in your heart is and the ways in which you could walk your path in deeper trust and greater love. 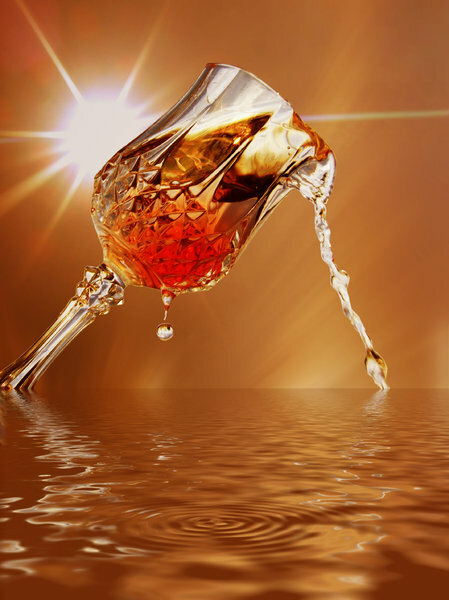 As you finish the last drops of liquid you look around and now feel more solid, stable and more substantial and capable of handling any situation which may arise in your life. You gently place the empty goblet on the soft earth and put your clothes on; readying yourself to return to the physical world in a renewed and more loving state. You feel rested and imbued with inner peace. When you are dressed take another look at the pond and know within your heart that this place will always be waiting for you any time you have need. As this thought runs through you and you focus on the inner strength you now feel, you become aware that the pond and forest and earth are beginning to fade from sight. Everything swirling back into an olive colored mist and you feel yourself slowly descending down. You pass once again through the moonlit night sky and the tops of roofs become more visible as you descend downward. You pass easily through the outside of the building in which you began this journey and come to rest gently back in the room in which you started. You become aware of your physical body resting comfortably in your room and as you gently allow your consciousness to slip back into your physical body you become more aware of the sounds, smells and energies in your space. Take a few deep breaths and when you are ready gently flutter your eyes open, returning to the here and now. The Moon is waxing towards its fullness on Oct. 27th. and the Goddess is flowing strongly through every part of my life. For this week’s Pagan Experience writing our focus is on Deity and the Divine and with that though in mind, I offer the experience of connection I have felt as the Moon moves through Her phases. 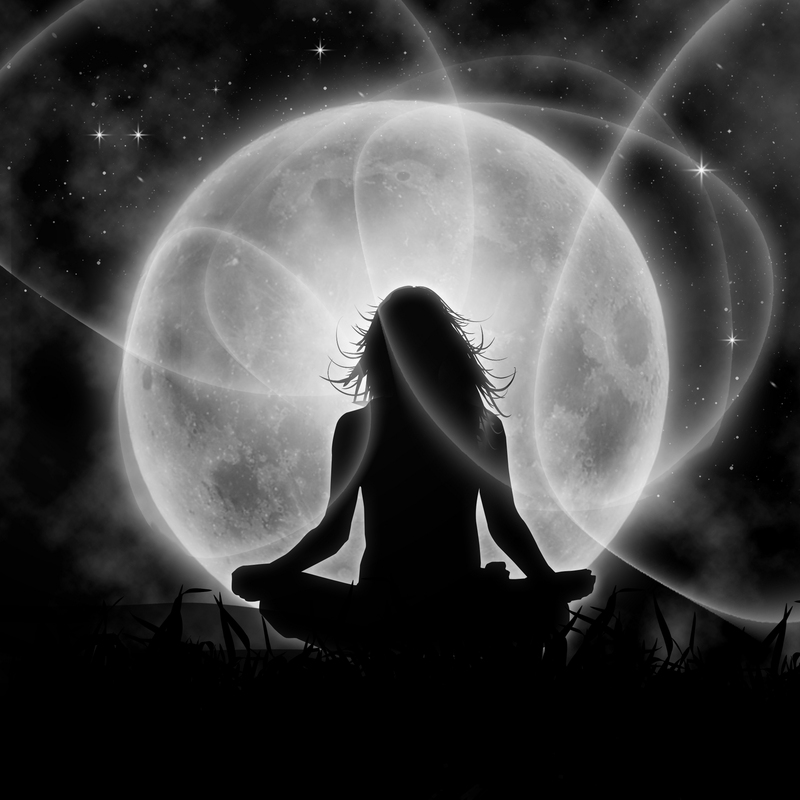 Although there are many Deities that I work work, the energy of Goddess in her mantle of Moon is present continually. She informs all aspects of my work, both mundane and magickally and each night as the darkness cloaks the sky Her watchful gaze is ever present. The interesting thing is that over the years, as I have consciously chosen to connect with the Goddess through her lunar phases, the depth of expression of that energy has opened to me as the veiling of the night sky and all that resides in that heavenly body lifts and the truth of cosmic connection that pulses through all manner of life becomes my space of awareness. From the vantage of Maiden Moon, the anticipation of what lay ahead to be seized hungrily lights the way of exploration of my human connection to the luminaries of planet, star and Universe. This is the enthusiasm of the youthful star gazer who wishes upon that special star for the love and companionship of another. This is the enthusiasm if one who greets each day with expectation that a new adventure will be offered. 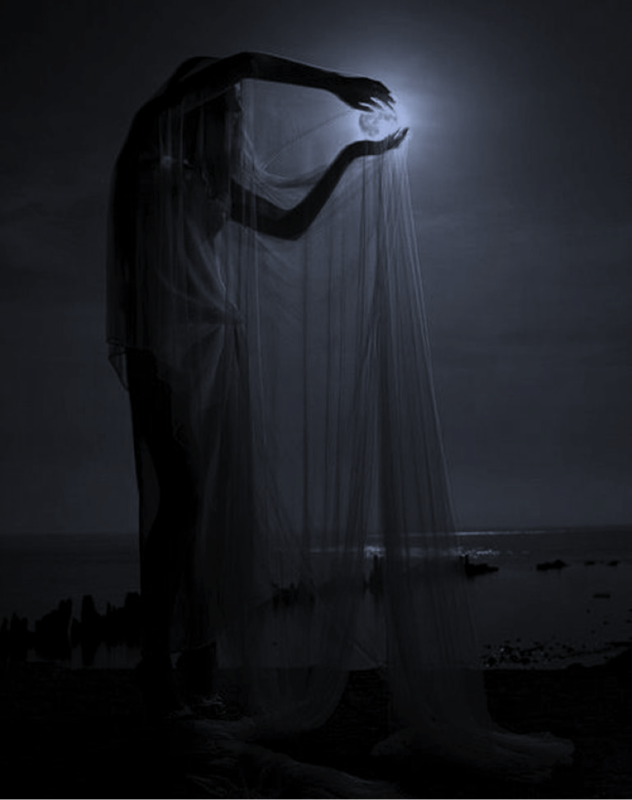 As I step into the brilliance of light that is Mother Moon, I see the product of my creation. I see the expanse of heaven and earth and the potential of life that is manifest, ethereal, corporeal and ephemeral, all my children and all that I love with the fierceness only a mother can know. What I have birthed, good-bad, viable or not are all the gifts of my lessons as creatrix and as nurturer of that creation. I am strength and beauty and I am both creator and destroyer. In the heavy darkness that is the shroud of the Dark Moon, I stand at the point where time converges. Past, present and future streams that are distinct yet all flowing simultaneously sensing the pulse of the eternal cycle within each other. I reach back to pull the tapestry of aeons of starseed tighter around a form that moves with the fluidity and grace of infinite wisdom. I call into my core the fleeting light that heralds future endeavors and the worlds that lay within that potential. I am both the center and all of the parts of the whole that form all the worlds of existence. This is the pervasive darkness of my mystery and the seed that spawns the first sliver of light in the shedding of my gnosis and become the Maiden seeker of that wisdom. For me, this is the gift and blessing of all that we call Deity. There are many forms that this naming assumes but its purpose is always that of deepening our connections and understanding of the space that is Divinity within ourselves.